A story centered around captured orbiting spacecraft, James Bond turning Japanese (?) and getting married, a finale that take place entirely in a volcano, and at long-last, the reveal of Blofeld! You Only Live Twice takes the Bond franchise to a whole other level. Unlike last week’s review of GoldenEye, You Only Live Twice was filmed comfortably in the middle of the Cold War with no major societal changes or long hiatuses between films. The only question looming over the franchise at the time was how do you top the previous film, Thunderball? Being the fifth film in the franchise, there was a pretty comfortable approach to the new production: take everything one step farther. The stunts were more elaborate, the sets were more exotic, and the gimmicks were far more ridiculous. But it was during the production of You Only Live Twice that Sean Connery announced that he would be leaving the role of James Bond after filming was complete, abandoning the franchise at the peak of its popularity. So since it may have been the last Bond film - better go all out! Sean Connery’s rise to stardom through the role of Bond made him quite possibly the most famous man in the world around 1964, and when the production team showed up in Japan for filming the fifth Bond adventure, people went nuts. Everywhere Connery went, he was swarmed with immeasurable amounts of both journalists and fans, with cameras flashing in his eyes, and crowds so thick of people tugging and screaming at him he could hardly move through them without the help of an army of local police. Couple that with the behind-the-scenes drama between the actor and the producers of the film over a monetary dispute, and Connery was fed up with being James Bond. Feeling as though he was integral to the series and deserved a far larger cut of the profits than he was receiving, he decided to venture out as an actor and leave all of the issues with Bond production company Eon Productions, leading to an actor change for 1967’s On Her Majesty’s Secret Service. There were a few other situations that nearly saw the end of the Bond franchise before Connery could even manage to leave the role. A last minute flight change for the main production crew to Japan was almost deadly. The swap saw them miss a fatal plane crash that killed all passengers on board, and likely would have ended the franchise with it, if not for that team’s last-minute change. Another fatal situation was narrowly avoided when a helicopter carrying the director of the film, Lewis Gilbert, crashed after filming an aerial sequence. The helicopter crashed into the sea, nearly drowning the camera operators, pilot, and the director. Luckily everybody made it out alright, and beyond that, were still actually willing to resume filming. Everything managed to work out for what was touted as Connery’s last Bond film, and we were delivered one of the most tastefully exaggerated films of the franchise. Fun fact: You Only Live Twice is written in part by Roald Dahl - yes, the author of Willy Wonka and the Chocolate Factory. He was a close friend of Ian Fleming (author of the original Bond novels) and even wrote the film script for Chitty Chitty Bang Bang, a children’s novel by Fleming, which Eon Productions also produced. Whereas the previous film, Thunderball, took you to the depths of the ocean, You Only Live Twice opens in outer space in a sequence that is still draw dropping fifty years later. THAT is how you outdo yourself. With an American astronaut floating out on a space walk, his spacecraft is suddenly swallowed by an enemy capsule. The enemy capsule closes around the American ship, to the very dramatic and unforgettable score by famous Bond composer John Barry. Cut to a beautifully slow and melodic theme song by Nancy Sinatra, which I find to be the most poetic and escapist Bond song, capturing the escapism and beauty of the Japanese setting of the film. In order to keep things under wraps, MI6 stages James Bond’s fake death, to keep any unknown spies from suspecting his investigation of just who exactly is playing the Americans and Russians against each other. This is another example of Bond’s death in a film, with a man wearing a Connery mask being suffocated in From Russia With Love, his death hinted at in Thunderball, as well as everyone thinking Bond was dead in Skyfall. Bond is sent to Japan after the British determine whatever captured the American spacecraft landed near a fishing island off of the mainland. 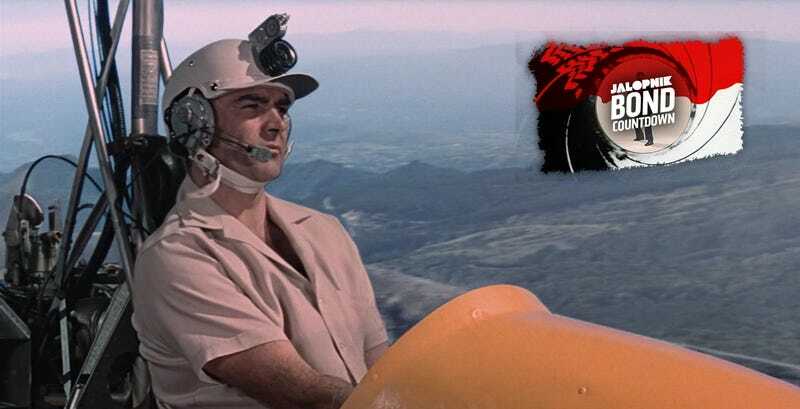 The rest of the film takes place in the country, with Bond meeting up with Tiger Tanaka, head of the Japanese secret service, to investigate a series of mysterious disappearances and deaths they believe will lead them to the source of the terrorizing rocket launches, which ends up being an elaborate launching pad hidden inside a hollowed-out volcano. Yes, this is where that trope comes from. This is the home of Blofeld’s operations, where he intends to pitch Russia and the West against each other in nuclear war by crediting each other for his attacks. After allowing them to annihilate one another, he plans to step up as the new ultimate world power. Bond only gets one bit of kit from the Q branch this film, and has Q himself shipped out to Japan to deliver it – much to Q’s frustration. The thing Bond requests is easily one of the most unforgettable gadgets to ever grace the big screen, a gyro-copter nicknamed “Little Nellie” which Bond uses for aerial surveillance of the mysterious island where people keep disappearing. Little Nelly got a hot reception. Four big shots made improper advances toward her, but she defended her honor with great success. There’s also the storied Toyota 2000GT, of which the company went out of their way to have featured in the film. When it was realized Sean Connery couldn’t actually fit in the car, Toyota obliged by cutting the roof off to make the car appear as a convertible. Quite possibly the only classic car to rival the appeal of the DB5 in the Bond films. The effects and sets designed by Ken Adam for You Only Live Twice are enough alone to allow this film a spot on any top ten listicle. Whether it’s the scenes of spacecraft in orbit, or an army of ninjas repelling into a giant volcano set, this film is overloaded with mind-blowingly good set design. When you imagine the look of a James Bond film, this is what you think of. It’s a look that’s so iconic that this is the film that is directly parodied in the Austin Powers series. It’s immediately recognizable. Couple the amazing visuals with John Barry’s best work as composer, and we get a truly beautiful film. My favorite scene in particular is Bond’s faux-wedding to become a somehow-convincing Japanese fisherman. The cinematography and Japanese style to the sets and costumes, coupled with the culture-clashing, soft and twanging melody of the soundtrack is perhaps THE standout scene in a movie full of standout scenes. Although why anyone believes, for even half a second, that this Scottish nationalist in a wig is Japanese just because he had a bit of a wedding, is still one of the great mysteries of what must be movie magic. [Mie Hama] was originally hired to play a character called Suki and Akiko Wakabayashi was hired to play Kissy. They had previously starred together in the Japanese spy thriller Kagi No Kagi (1966) which was redubbed by Woody Allen to create What’s Up Tiger Lilly? (1967). Hama was considered at the time to be the “Japanese Brigitte Bardot”. Both women had to learn English for the roles, but Hama struggled to do so and was going to be let go and replaced. However, the producers were warned that if this happened, she might commit suicide out of shame, so they rejigged the script to make the part of “Suki” much bigger and the Kissy role smaller and Akiko Wakabayashi agreed to switch roles, so they renamed Suki as Aki out of gratitude to her. As a result, in spite of technically being the main Bond girl, Kissy appears for barely 12 minutes of the film and all her lines were dubbed by Nikki Van Der Zyl. So rushed was this change that her name is NEVER ACTUALLY SPOKEN ON SCREEN! We only find out she’s called Kissy in the end credits! This is the third James Bond movie to have an all-out battle for a finale, but grows it to a scale that far surpasses anything that has come before it. It’s Tanaka’s army against Blofeld’s in a sequence full of stunts, ninja fighting and explosions. Outside of the finale, the fight sequences throughout the film are excellently handled, especially for the times. With From Russia With Love, Bond standardized the quicker-paced, tighter cut fight sequence. Three films later, the franchise mastered it. The scene with a sumo-sized henchman in the office of a chemical manufacturer is one of my favorite fights in the series, rivaled only by the final fight with Oddjob in Goldfinger. Weirdly enough, it turns out the actor in this fight scene is the grandfather of Dwayne “The Rock” Johnson. Small world. Donald Pleasance’s Blofeld is the third movie featuring of the super-villain in the franchise, but You Only Live Twice is the first film to reveal his appearance to the audience. Rather disappointingly, he’s a short, weak, twitching bald man with a comical scar over his right eye. The previous appearances built up a calm, mysterious and dangerous man who calculated every possible outcome and acted without hesitation. That is not the character we get with Pleasance’s portrayal, though the writing is likely to blame. The character opens itself up to easy parody, as he’s almost already a joke in this film. With Connery thinking this is his last appearance, it shows in his characterization at times. He seems lazier and almost disinterested in his scenes - though I don’t find it to be nearly as bad or distracting as other fans have made it out to be in the past. There are worse Bond performances by Connery yet to come with Diamonds Are Forever and Never Say Never Again. The standout terrible aspect of this movie is turning a 6-foot-2-inch tanned-skin Scottish man into a convincing Japanese person through “plastic surgery” that amounted to two minutes of makeup and a wig. What’s bad about it? It’s impossible to turn a 6-foot-2-inch tanned-skin Scottish man into a convincing Japanese person. They didn’t even try an accent. Also, you know, it’s probably a bit racist, in hindsight. You Only Live Twice is the fifth Bond film, and the sixth on our list. This movie manages to offer more than Thunderball, which is a tall order to fulfill, but it manages just fine with the greatest sets, the greatest soundtrack, and a great, if aged, finale that makes this one of the lightest and most fun entries in the series.